If you are thinking about tying the knot on Cape Cod, you may want to consider some of these fabulous locations on the Upper Cape for your wedding day! 1. The Brookside Club, Bourne: The Brookside Club features a charming clubhouse located atop a majestic ridge which overlooks their championship golf course. The Brookside Club also has gorgeous views of Cape Cod Bay including spectacular sunsets. Aside from offering indoor accommodations for parties up to 150 people (and outdoor tented accommodations for parties up to 220), Brookside has catering services available and ceremonies can be performed here as well. 2. Willowbend, Mashpee: The idyllic grounds of Willowbend make for the perfect setting for a Cape Cod wedding. Willowbend can accommodate up to 300 people and they are open year-round. Willowbend is known for helping to make every moment of your special day exceptional. 3. The Country Club at New Seabury, Mashpee: This venue has fabulous ocean views and is a great choice for brides looking for a formal wedding setting. The Grand Ballroom can accommodate up to 200 guests and there are menu packages available. 4. Popponesset Inn, Mashpee: This sister property to the Country Club at New Seabury offers a wonderful spot for a true beachside wedding. The season here runs May through October because the area for weddings is tented outdoors. Popponesset can accommodate up to 200 guests. 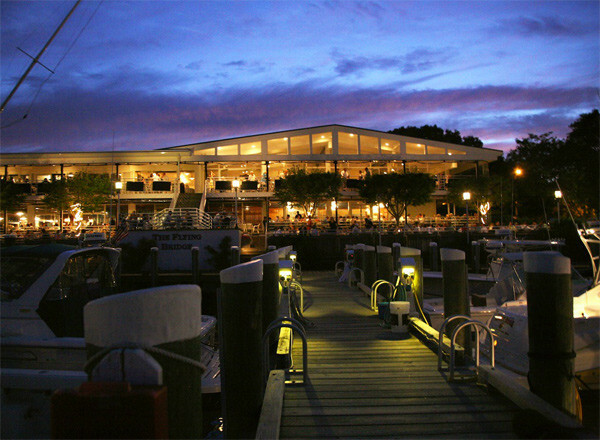 This location has been named "Best Wedding Location" by Cape Cod Life Magazine and is sure to impress. 5. The Flying Bridge Restaurant, Falmouth: Offering the full second floor to wedding parties, the Flying Bridge Restaurant can accommodate up to 225 guests. The second floor has floor to ceiling windows and offers fantastic views of Falmouth harbor. Not only does this venue offer lovely views, but the photo opportunities are amazing. 6. The Beachmoor at the Mass Maritime Academy, Buzzards Bay: The Beachmoor - once the home of William O. Taylor, former publisher of the Boston Globe - has a gorgeous lawn that overlooks the water on which couples can exchange their vows. The venue can accommodate up to 160 guests. Their season runs March through December and they have menu packages available. 7. The Dan'l Webster Inn and Spa, Sandwich: This is an iconic Cape Cod location and for good reason! The grounds are well-manicured and the elegant dining rooms can accommodate up to 150 guests. The Dan'l Webster has a professional wedding planner who can help you through the process of making your dream a reality and there are lovely guests rooms and suites, as well as a spa â€“ perfect for your wedding party or even for a honeymoon! 8. Highfield Hall, Falmouth: This Queen Anne style mansion was built in 1878 and has been a Cape Cod gem ever since. Highfield Hall is well-known for many things, including the conservation land which surrounds it (great for photos!) and they host a limited number of events per year, so while couples can be assured special attention, it is imperative to reserve your spot well ahead of time. With a tent, Highfield Hall can accommodate 200 guests. 75 guests can be accommodated for an indoor sit-down reception and 125 guests can be accommodated indoors for a cocktail style reception. 9. The Ridge Club, Sandwich: An absolutely idyllic setting for weddings, the Ridge Club in Sandwich is glamorous and charming. With the ability to accommodate up to 180 guests, the Ridge Club is certainly a grand location for any reception. 10. Heritage Museums and Gardens, Sandwich: One of the most stunning garden locations on the Cape, the Heritage Museums and Gardens are a great spot for a wedding. The grounds provide countless opportunities for unique and memorable photographs. 120 guests can be accommodated indoors and 300 can be accommodated outdoors. 11. Coonamessett Inn, Falmouth: Featuring three distinct dining rooms which host over 150 weddings per year, Coonamessett has different options available for couples and provides the assurance of experience. The Cape Cod function room overlooks Jones Pond and the beautifully kept grounds. Up to 300 guests can be accommodated and menu packages are available. 12. Cape Cod Winery, Falmouth: Wine and weddings go together like peas and carrots, peanut butter and jelly, or fair-skin and sunscreen! Situated within the vineyards is a rustic barn which offers seating for up to 75 people, making this the perfect situation for intimate to medium sized wedding parties. If your party is larger, tents can be arranged on the grounds to accommodate. Whichever location you choose, you can be sure to enjoy the special charm for which the Cape is well-known.